We braved the crowds in Clarks a couple of days before the start of term, to buy the children new school shoes. 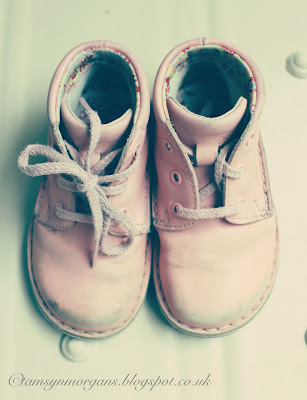 My daughter has not only shot up in height recently (she is eight) but her once tiny little feet are now size 2. Size 2! My baby is growing up, and fast! 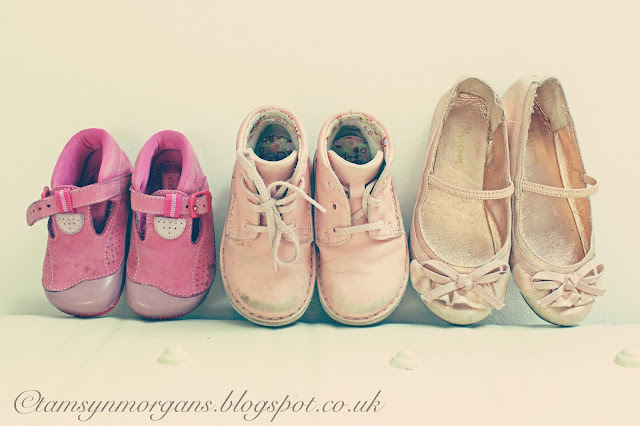 Being the sentimental so and so that I am, I have kept some of the children’s shoes from when they were tiny. Not all of them sadly, I got rid of the sweetest pair of jelly shoes she had when she was about two years old and still feel sad about that to this day – the pale pink boots in the picture above were in a bag to go to a charity shop, only to be rescued at the last minute. I’m so glad I did, because they hold precious memories for me, and they are a reminder of how small (and naughty!) she used to be, and of how much she has grown to be the funny, kind and loving person she is today.